To find other places to visit, more things to do, ratings, and more tourist information, use the Milan tour builder tool . Vancouver, Canada to Milan is an approximately 15.5-hour flight. You can also do a combination of flight and train; or do a combination of train, bus, and flight. Due to the time zone difference, you'll lose 9 hours traveling from Vancouver to Milan. When traveling from Vancouver in May, plan for a bit warmer days and about the same nights in Milan: temperatures range from 26°C by day to 15°C at night. On the 29th (Tue), you'll travel to Cinque Terre. 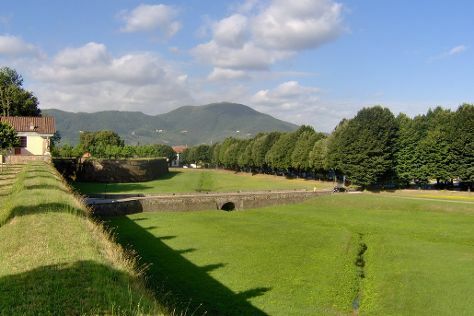 Change things up with these side-trips from Cinque Terre: Lucca (Le mura di Lucca & Guinigi Tower), Portovenere (in Porto Venere) and Pisa (Duomo di Pisa & Torre di Pisa). There's much more to do: trek along Footpath Monterosso - Vernazza, learn about winemaking at Terra di Bargon, step into the grandiose world of Castello Doria, and stop by Art in Banchi. Plan my day in Cinque Terre using traveler tips and tourist information provided by Inspirock. You can take a train from Milan to Cinque Terre in 3 hours. Alternatively, you can drive. Expect a daytime high around 25°C in May, and nighttime lows around 13°C. Wrap up your sightseeing on the 2nd (Sat) early enough to take a train to Rome. Rome is known for historic sites, museums, nightlife, shopping, and classes. Your plan includes some of its best attractions: steep yourself in history at St. Peter's Basilica, explore the world behind art at Galleria Borghese, make a trip to Roman Forum, and delve into the distant past at Palatine Hill. To see where to stay, ratings, reviews, and other tourist information, read Rome itinerary planning tool . Getting from Cinque Terre to Rome by train takes about 5 hours. Other options: drive; or do a combination of train and flight. Expect a daytime high around 34°C in June, and nighttime lows around 21°C. Finish your sightseeing early on the 5th (Tue) to allow enough time to travel to Palermo. Change things up with these side-trips from Palermo: Tempio di Segesta (in Calatafimi-Segesta), Duomo di Monreale (in Monreale) and Riserva Naturale Orientata dello Zingaro (in Castellammare del Golfo). 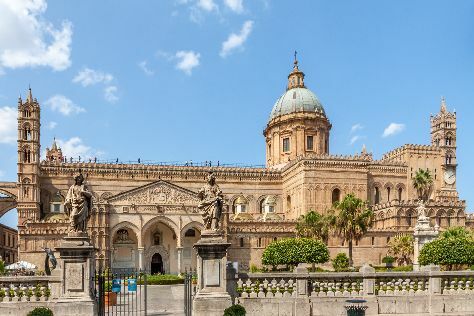 The adventure continues: pause for some serene contemplation at Cattedrale di Palermo, make a trip to Palazzo dei Normanni e Cappella Palatina, explore the different monuments and memorials at Catacombe dei Cappuccini, and admire the striking features of Palazzo Di Rudini. To see ratings, photos, maps, and more tourist information, refer to the Palermo journey website . You can fly from Rome to Palermo in 4 hours. Other options are to do a combination of car and ferry; or take a train. Cap off your sightseeing on the 8th (Fri) early enough to travel to Bari. Venture out of the city with trips to Grotte di Castellana (in Castellana Grotte), Matera (Casa Noha & Sassi di Matera) and Alberobello (Trullo Sovrano & I Trulli di Alberobello - World Heritage Site). There's still lots to do: step into the grandiose world of Castello Aragonese, don't miss a visit to Centro Storico di Polignano a Mare, contemplate in the serene atmosphere at Basilica San Nicola, and take an in-depth tour of Masseria Brancati. For other places to visit, where to stay, photos, and tourist information, refer to the Bari road trip planning site . Do a combination of flight and train from Palermo to Bari in 4 hours. Alternatively, you can do a combination of bus, flight, and train; or do a combination of car and ferry. In June, plan for daily highs up to 32°C, and evening lows to 20°C. You will have some time to spend on the 12th (Tue) before leaving for home.